I’m always on the look-out for something interesting for you and this morning I discovered this: Dame Fortune’s Wheel Tarot by Paul Huson (published by Lo Scarabeo) actually has a Significator card! Of course, you may still select a Significator using whichever method you prefer, but what a time- and sanity-saver this card will be! 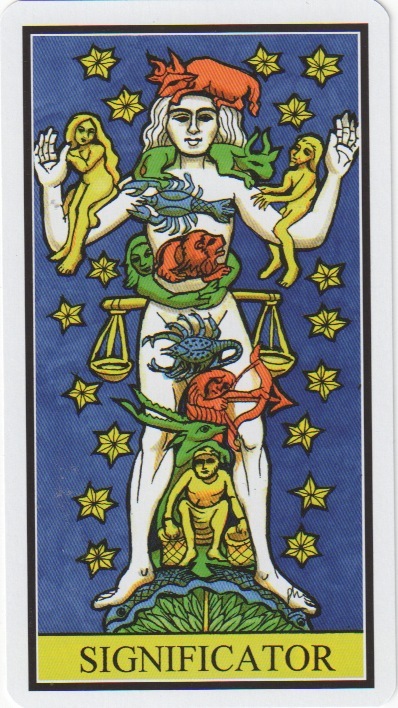 The deck itself takes the medieval wood-cut style of the Marseilles but expands the colour-scheme and adds a semi-illustrated Minor Arcana to the mix (the pips are presented within a meaningful scene). The suits themselves are Batons, Cups, Swords and Coins with each suit rendered in a particular palette and bordered in the same colour – making suit identification possible from the merest sliver of card. Anyone familiar with the Rider Waite Smith deck would be able to use this deck very easily, I think. In the Major Arcana, the card names are traditional – a Juggler and a Female Pope replace the Magician and the Hgh Priestess. I also see that Strength transforms back into Fortitude and occupies the 11th Arcana place, while Justice slips into her traditional 8th position. I notice that Major Arcana card (Death XIII) is numbered but not titled! The Courts are sufficiently interesting that they warrant a little blog post of their own. I was amazed to see that the deck had its own Significator – do you know any other decks that have this feature? Do tell! I don't think that I'd like to remove a Major Arcana card from a reading to act as a Significator, so I think I'd be with you on that one, Chloe! Yeah, I'm with Arwen – it's a neat time-saver, but isn't it kind of pointless? Unless you believe that the physical/meditative layout of the spread is everything, which I don't, if it's one standard card with no meaning to it then I'm not sure why it would need to be there. The deck itself looks really interesting! I like the art and the more old-school approach. My partner really loves Marseilles-based decks and art styles, I think this is one she'd like to take a look at. Some people don't like using Significators because it automatically removes a card from the 78 available from the deck. This would remove that issue. It would also encourage anyone who has never used a significator (for whatever reason) to try working with one. And then, hopefully, they could progress to using any technique to select a Significator for their client and glean even more information from the reading for them. As a deck, I think if anyone fancies working with a Marseilles deck, but is put off by unnumbered pips, it would be a great deck for the stable! had that deck for a little bit. wasn't for me, but yeah, i did think that the significator card was a pretty cool feature and well executed even if, again, using it not really my thing. Doesn't it totally remove the entire point of choosing a significator? Most people that use a significator probably just chose a card and slipped it out of sight beneath the rest of the cards in the spread, Arwen. Of course the ENLIGHTENED reader of m'blog now has WAY more interesting things to consider if they want to use as a significator!